On October 23, 2018, a team of volunteers, researchers, and staff placed thousands of juvenile Olympia oysters into Elkhorn Slough Reserve in Monterey Bay—2,400 live oysters that were at least three months old, and 16,950 additional live oysters that were only about a month old. Although fewer of the month-old oysters will survive, the estimated number of oysters that will survive to adulthood is well over 10 times the current Olympia oyster population on the reserve, giving the local population a sorely needed boost. The project, funded by a grant from the Anthropocene Institute and supported by California Sea Grant, is the first attempt to support native oyster restoration using aquaculture in California. California Sea Grant Extension Specialist Luke Gardner, who is based at the Moss Landing Marine Laboratories (MLML) in Monterey Bay, worked with project leader Kerstin Wasson, Elkhorn Slough Reserve’s Research Coordinator, and colleagues at MLML to help spawn and raise the juvenile oysters in MLML’s new aquaculture facility. Olympia oysters, the only native oyster species on the West Coast, were once common in bays and estuaries up and down the California coast. But in the 1800s and 1900s they declined precipitously because of overharvesting. Populations have been slow to recover and researchers are not exactly sure why, although they suspect that pollution and sediment changes may be involved. In Elkhorn Slough, a seven-mile estuary off of Monterey Bay that is one of 29 National Estuarine Research Reserves nationwide, the Elkhorn Slough Reserve and Foundation has been working for the past ten years to conserve the native Olympia oyster. Their research has found that while oysters can survive in the slough, they have stopped reproducing regularly. 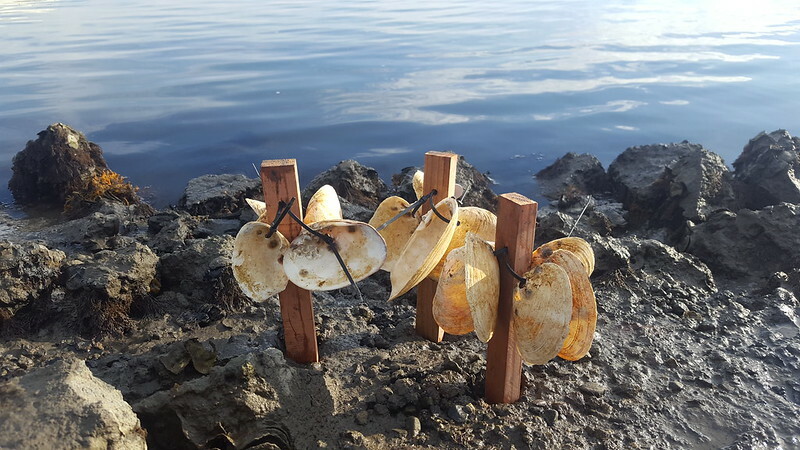 Elkhorn Slough Reserve’s Research Coordinator, Kerstin Wasson, has been tracking natural recruitment of oysters in the estuary for the past decade. “In all the years I’ve been monitoring, we only had a good crop of new juveniles appear twice, once in 2007 and once in 2012,” she says. Whatever the cause of the reproductive failure, one obvious solution was to spawn the oysters indoors, like oyster farmers do up and down the coast with both native Olympia oysters and other imported species. MLML was just developing an aquaculture facility, so the timing was right. Wasson and her former student Brent Hughes, now a professor at Sonoma State University, applied for and received a grant from the Anthropocene Institute to fund the aquaculture project. To raise a new generation of oysters, the researchers collected 50 mature oysters from different locations in the slough, and brought them into the lab, where MLML researchers Peter Hain and Dan Gossard had set up hatchery facilities and modified them for production of Olympia Oysters. They also built a microalgae production system to produce food for the baby oysters, a complicated setup that included water filtration, LED growlights, and ultraviolet sterilizers. “This was all very new to the MLML crew and we learned a lot from our colleagues at the Bodega Marine Laboratory, who have raised several crops of Olympias,” says Hain. The researchers used warm water to encourage the oysters to spawn over a period of several months. Then they fed and cared for the larvae till they settled on clam shells provided for that purposes, and grew large enough to be transplanted into the wild. “The hard part of raising these oysters is feeding them,” says Gardner. Olympia oysters are filter feeders that dine on small algae species, or microalgae. Growing oyster larvae in the lab meant that Gardner and colleagues at MLML had to first cultivate microalgae species to feed to the oysters. “Raising oysters is a finicky business, but we got them through,” says Gardner. Past data suggest that the oysters placed yesterday will grow quite well, but the team will check on survival and growth quarterly for the first year and annually after that to see how they fare, says Wasson. The data could also help them understand what parts of the slough are conducive to oysters and which are less so, which could help future restoration efforts. “Part of this project is all about rescuing oysters, but also to place them in different areas where we can learn about their species interactions and possibly new areas for restoration,” says Hughes. NOAA’s California Sea Grant College Program funds marine research, education and outreach throughout California. Our headquarters is at Scripps Institution of Oceanography, University of California, San Diego; we are one of 33 Sea Grant programs in the National Oceanic and Atmospheric Administration (NOAA), U.S. Department of Commerce. With otters away, what keeps urchins at bay?